In 1949, Mr. Kihachiro Onitsuka began an athletic footwear company (Onitsuka Co., Ltd.). He started by manufacturing basketball shoes out of his living room in Kobe, Japan. He chose the name ASICS for his company in 1977, based on a famous Latin phrase "Anima Sana In Corpore Sano," which means of "A Sound Mind in a Sound Body." Taking the acronym of this phrase, ASICS was founded on the belief that the best way to create a healthy and happy lifestyle is to promote total health and fitness. ASICS has grown to offer a full line of performance-driven athletic shoes, apparel, and accessories dedicated to bringing harmony to the body and soul. ASICS has long been one of the leaders in the running industry. I have been interested in trying them for a while. 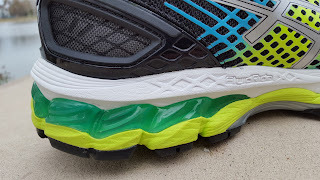 They use gel as part of their cushioning platform and I have been told by several friends how much they like their ASICS so I knew I had to test them out. ASICS sent me the Gel-Nimbus 17 to review. I was thrilled since it was given Runner’s World’s highest award, the Editor’s Choice, in summer 2015. The Gel-Nimbus 17 features areas of gel in key spots. The gel pockets sit in the front and heel of the shoe to provide protection during your heel impact and toe off. The gel did feel very comfortable, which wasn’t a surprise from what I have heard. To be honest, it would take way too long to go ever every feature of this shoe, so I will cover the key components. The upper material is made up ASICS FluidFit material that combines multi-directional stretch mesh with stretch reinforcements. The eyelets are independently placed so it disperses the tension more easily. This allows for a more customized fit, which is great because everyone feet are shaped differently. The Gel-Nimbus 17 also has a heel clutching system to provide more support and it’s all put together without any seams. This makes the shoe more comfortable and reduces the risk of chafing. I really liked the feel of the shoe and how it fit. The upper material seems very durable so the shoes should last for a while. The outsole has a few features that I really like as well. The Guidance Line Midsole and Guidance Trusstic Systems that ASICS used allows for a more efficient gait while improving midfoot structural integrity. The midsole uses ASICS FluidRide midsole material that provides a nice balance of energy return and cushioning. This material reduces the weight of the shoe without sacrificing the durability. The ComforDry X-40 sockliner provides higher rebound properties while having superior moisture management and breathability. 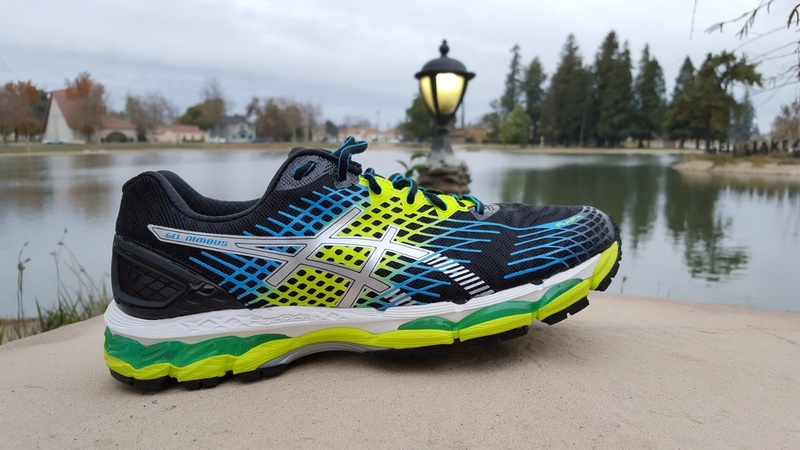 The Gel-Nimbus 17 weighs in at 10.8 ounces and has a heel drop of 10mm. I am used to a shoe with a lower heel drop and that weighs a little less. I was surprised that the Gel-Nimbus17 didn’t feel that heavy and I didn’t encounter the same issues I have had with other shoes with a 10mm heel drop. 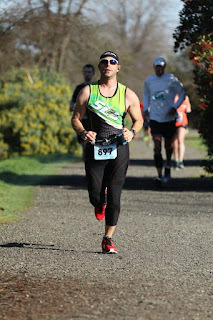 The heel drop wouldn’t be an issue for most people anyway, but I tend to run in low heel drop shoes. The best way for me to describe the Gel-Nimbus 17 is that I went out for a run and my feet just felt great, mile after mile. This is a great looking shoe that feels very comfortable. I usually wear a size 10 and it was recommended to get a half size up, so I tested a size 10.5. I would recommend going up a half size as well. I am extremely pleased with the Gel-Nimbus 17 and all of the features, from the cushioning to the Fluid-Fit upper material with seamless construction. 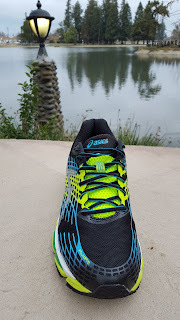 ASICS put together a very comfortable shoe that is perfect for any run. 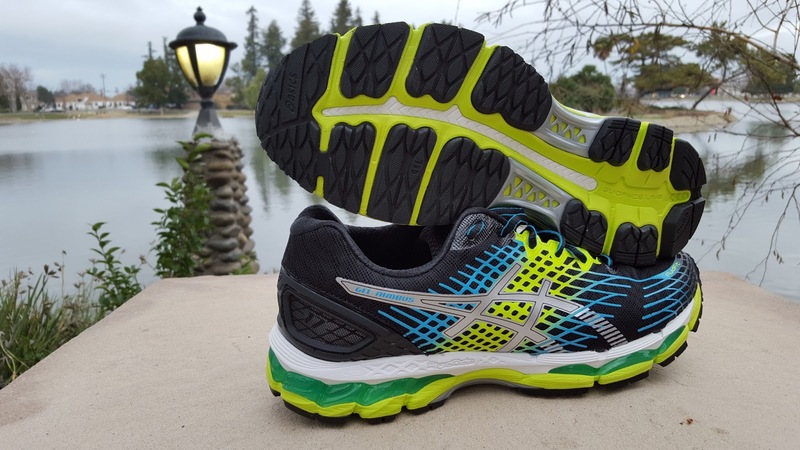 I can see why Runner’s World gave the Gel-Nimbus 17 their Summer 2015 Editor’s Choice Award. You can pick yours up at the ASICS website for $150, on Amazon for about $109, or at your local retailer (click here for locations).